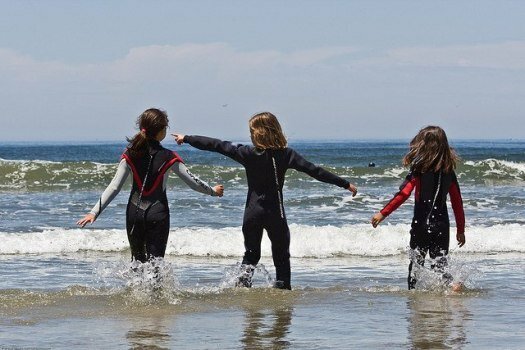 Buying childrens wetsuits and rash guards can help both you and your child. If your little guy or girl is comfortable and warm in the water with a kids wetsuit on - it makes for a better experience for both of you. Or if he doesn't need the warmth, he can get full protections from the sun from a proper rash guard. And who doesn't love a win-win situation? Whether swimming, scuba diving or surfing, you’ll want to choose the kids wetsuits or rash guards that provide the maximum protection and comfort. Let's start with childrens wetsuits since there is more to know about them to ensure you get the best one for your child. Having the right information at your fingertips goes a long way to getting your little swimmer exactly the wetsuit he needs. There are some basic criteria that apply to both adult and child sized wetsuits. There are also some issues that make buying childrens wetsuits a little more challenging than adult suits. We will also address those issues in this article. Whether you are buying childrens wetsuits or adult wetsuits, the most important element is suit thickness since this is what provides warmth in cool water. Wetsuits are produced on a thickness scale, which measures thickness of body and arms and legs. Having fun in the pool. A child's wetsuit will work here too. Of course, everyone is different so what works for one person may not work for another. You probably have a general idea of how cold your child gets in the water. If he or she is always coming out blue lipped and shaking, you may want to try a slightly thicker child wetsuit to start out with. 6.5 mm Water temperatures between 50-70; at the lower end you are getting into drysuit territory - probably not water your child will be swimming in. You will see some suits with 2 numbers, for instance a 4/3 full suit. A note on A 4/3 full suit has a 4mm thickness in the body and 3mm in the arms and legs. The thicker portion covers the core of your body to keep you warmer, while the second number covers your extremities and is a little thinner allowing some extra mobility. Childrens wetsuits that have short legs that end just above the knees and short sleeves are called shortie (shorty) suits. This is probably the most popular type of wetsuits for children that are swimming (as opposed to scuba diving) since it offers warmth but has more room for movement than a full suit. Full wetsuits can keep your child warm in the ocean. Childrens wetsuits that have full legs but no arms is called a farmer john. The type that is best for your child depends on what they will want to do in it. For scuba diving, especially in cooler water, a full suit is recommended. If your child is swimming and running around in the water and just plain being a kid, and the water temperature is in the high 70's or so, shorty suits would probably be the best choice. They offer warmth but also allow for more flexibility. The quality of a childs wetsuit may be less important than the quality of an adult wetsuit. The reason being that your child is growing and the suit may only last a season or two as opposed to, say, the five years an adult can get out of a suit. So a child is liable to outgrow the suit before they get full use from it. This is not to say that you want the cheapest suit for your child since you want them to be comfortable (cheap suits tend to have seams that stick up and can be uncomfortable). But you also probably don't want to spend a ton of money on a suit that will only last a summer. A medium quality childs wetsuit should be fine - offering comfort and protection at a reasonable price. You can often judge the quality of the suit by how strong the seams are. The better the quality of the suit, the more secure the seams will be. Seams that fit tightly together, are smooth (lay down), have blind or flat lock stitching (see our page on buying a wetsuit for details) and are reinforced by either glue or a second piece of fabric over the seam signify a well-made suit. Seams that have bumps, ridges or exposed stitching are the sign of a cheaper suit. Before you purchase a kids wetsuit, you’ll want to make sure that it fits well. Of course, the best way to do this is by trying them on. Only by seeing the suit on the child can you tell if it will provide the maximum protection and allow the proper amount of movement. If you buy online, check the return policy in case the fit isn't right. A wetsuit is meant to be snug for a proper fit. If the childs wetsuit is too loose, water will run freely through it which makes it lose its insulating properties. Of course, you have to balance this with your child's growth. Though a snug fit is generally recommended to ensure maximum warmth, allowing a small amount of growth room in children’s suits can be doable and can be a money saver. But don't buy it too big or your child will not get any warming qualities from the suit. 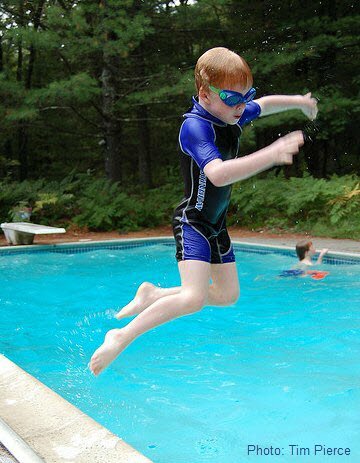 While childrens wetsuits are meant to be snug, they should still be able to have movement. Have them cross their arms in front of their chest. If their movements are very restricted, you may need to go up a size and vice versa. If you see folds in the suit at their armpits or crotch, you should go down a size. It is hard to give a size chart since childrens wetsuit sizes will vary by manufacturer. But once you choose a manufacturer, almost all have a sizing chart to help you choose the right one for your child. To try and save you some time and to help make your choice a bit easier, we have read tons of reviews and ratings of childs shorty wetsuits (we will have a separate article on the best full children's wetsuits). Our view is that if an overwhelming number of parents have a favorable review of a suit, chances are that you will have a good experience also. As far as pricing goes, costs for childrens wetsuits will vary depending on the quality of the suit. However, most good quality children’s suits seem to range from $30-$100. In this, like almost everything else in life, you get what you pay for. Since children will outgrow wetsuits, it can get expensive to keep buying new suits as they get older. To this end I have picked 3 well rated suits that are all under $50. In addition I also give you our pick for best value kids suit (see below). In case you don't mind spending a little more money, I also give you a shortie wetsuit pick that gets great reviews and is at a higher price point. Our first pick for best childrens wetsuits is a Realon model. It gets great reviews from the vast majority of parents (rated 4.6 out of 5.0 from 50+ reviews) and most say they are extremely satisfied. This wetsuit has flat lock seams and a durable zipper that can withstand the pulling and tugging from kids according to most reviews. It is made of a thick 3mm neoprene material and has an adjustable collar for maximum comfort. This kids wetsuit is available in sizes xs to xxL which according to the sizing chart is suitable for ages 2-12 years. From the many reviews I have read, I have put together a list of pros and cons of this pick for best childrens wetsuits. 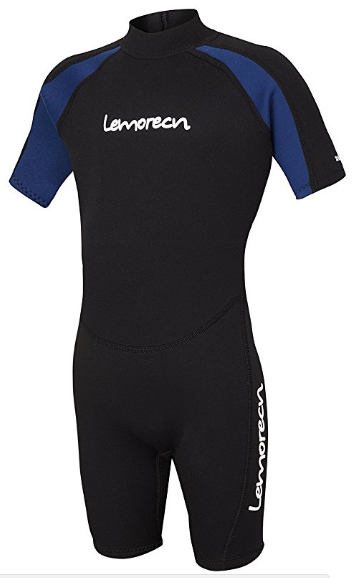 This next pick for best childrens wetsuits is a Lemorecn model. This wetsuit has gotten some great reviews from parents and kids alike scoring 4.5 out of 5.0 from 35+ reviews. This suit is made of 2mm neoprene, so a little thinner than our first pick but still thick enough to do the job. It has flatlock seams for comfort and durability. It also has an extended pull on the zipper making it easy for a child to take it off and put it on by themselves (wish I could say that for my wetsuit!). This wetsuit for kids also boasts a 50+ UV shield which should make the adults secure. It is available in sizes 4-16. On this suit, there seems to be a bit of descrepency as to the sizing. Some say sizing is true while a few say it runs small. Be sure to check the sizing chart and perhaps reviews with child's age/size and wetsuit size ordered to ensure you get a proper fit. Our third choice for the best wetsuit for kids is a Seavenger model. This wetsuit has gotten many good reviews from parents and also gets our vote as Best Value wetsuit (under $25). Users rated this suit a solid 4.1 out of 5.0 from 95+ reviews. This pick has a front zipper ensuring an easy on off for your child. It also has flat lock stitching for more comfortable wear and blocks 50+ UV rays. The arms on this wetsuit are made of Lycra. So while it may not be as warm as a full neoprene suit, it does give greater ease of movement. The arms are also of a different color so your child can get in the water with style :). In addition, the wetsuit has a 4-way stretch panel on the sides which should make it comfortable to use. This suit is available in sizes 2T - 7/8 which the manufacturer equates to 2-10 years of age. The above picks best childrens wetsuits are all moderately priced at under $50. However, I wanted to give an excellent choice for those that don't mind paying a little more for a child's suit. 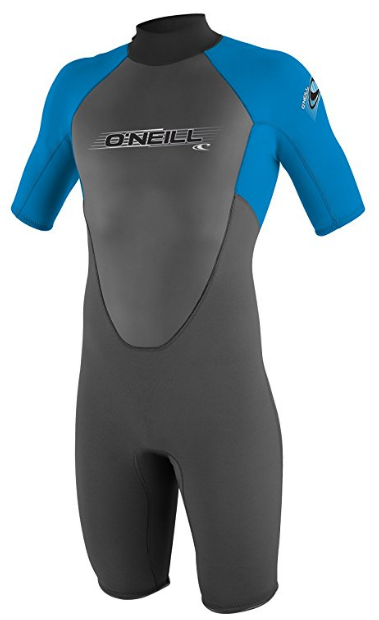 Looking at all the choices, the one suit that stands out is an O'Neill model. It is priced in the $55-$95 range depending on size/color. Not cheap by any means but by all the reviews, it is worth it. What struck me is how many people said they bought another one or were going to buy another one when their child outgrows their current one. Now that says alot! This wetsuit got a great 4.4/5.0 rating from 150+ reviews and is available in sizes 4-16. It has flatlock stitch for comfort and also has seams placed where they won't chafe as much when moving. If your child doesn't need the extra warmth childrens wetsuits provide, a good alternative for sun protection would be a rash guard. This will help protect them from small abrasions and keep their skin out of the sun. With a SPF rash guard you will need to put less suntan lotion on them which is always a plus! I have picked a couple of highly rated rash guards for both boys and girls. They come in all sizes and lots of different colors so you should be able to find one that suits your child. For this I picked a Tuga model. 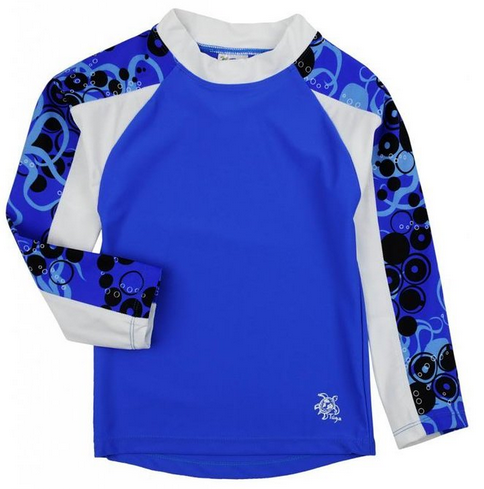 This long sleeve rash guard has an SPF of 50+ so you can protect your child's sensitive skin. This is a cute rash guard and your girl should look nice and stylish playing out in the water. Lots of parents gave it high marks for its looks and, more importantly, its ability to protect their child from sunburn. It has a higher neck so even less sunscreen is needed. If you prefer, this rashguard also comes in a short sleeve version. You can find the details here. The company also offers this in a set with swim shorts for a complete stylish looking set. See all the information on the set here. For the boys I also picked a Tuga model. This company gets lots of great reviews from parents so I went with the tried and true. 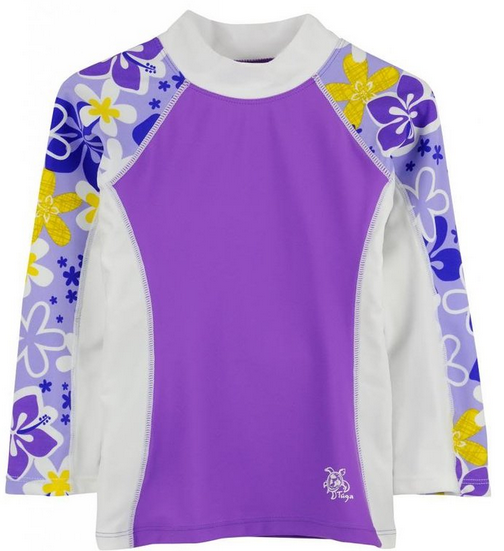 Like the girls rash guard, the boys is also chemical free and has a higher neck for extra protection from the sun. The boys versions comes in lots of different colors and designs so your child (or you!) is sure to find one that he loves. If you prefer, the company also offers a short sleeve version. You can find this rash guard in a short sleeve version here. If you would like a complete swim outfit, the company offers a rash guard along with swim trunks here. We hope you found this guide to picking the best childrens wetsuits or rash guards for your child useful. May they have many hours of warm, fun in the sun and water! If your child needs a wetsuit or rashguard because he/she is going snorkeling, you may find our page on finding the best snorkeling equipment for a child useful. We include our picks for best snorkel set and best snorkel vest also.